These Oreo Acorn Balls are SO adorable! 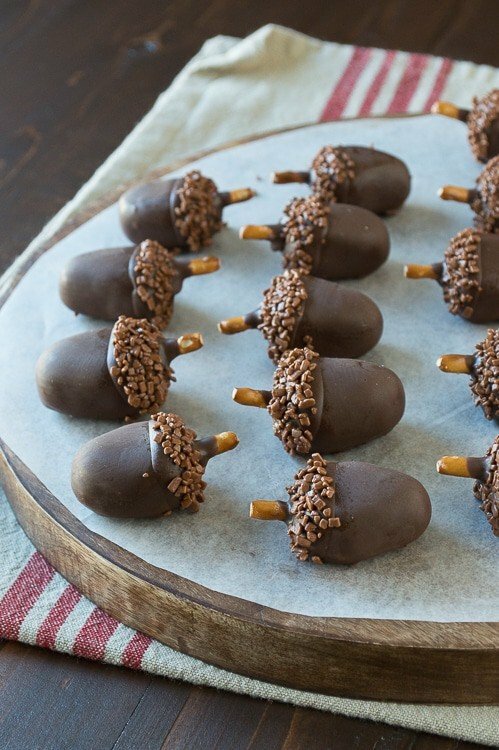 Peanut butter oreo balls made to look like acorns!! We’re not squirreling around – it’s another acorn treat!!! We’re nuts about acorns. Or maybe we’re just nuts for nuts! I posted a recipe for maple acorn sugar cookies last week. They are dreamy, and SO cute, and worth all the time they require. But my love for acorns couldn’t stop there, so we’re back with another acorn treat! You probably already know that Ryan loves squirrels. So much so that he subscribed to Wally the Squirrel’s youtube channel! If you’re confused, Wally is a family’s pet squirrel and they post videos of him on his own youtube channel. Only 11,000 people have subscribed to his youtube channel, but I bet you that all of those people are serious squirrel lovers. And I really like these oreo acorn balls, they are so adorable! This recipe is a fun twist on the classic oreo ball, which are usually, well balls. So shaping them into acorns makes them extra cute. I also used peanut butter oreos to make these acorn balls extra nutty, and because squirrels love nuts, so why not, right? If you’ve made oreo balls before, you’re probably familiar with the process, but if you haven’t they are super easy and delicious, I mean, who doesn’t like crushed up oreos dipped in chocolate? Especially when these Oreo Acorn Balls look like little acorns! 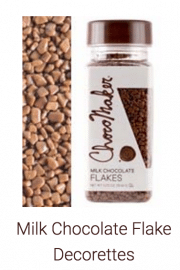 Brown sprinkles, I used chocolate flakes but brown jimmies work great too! Once the cream cheese is soft, mix the oreos and cream cheese together, making sure the mixture is very well blended. 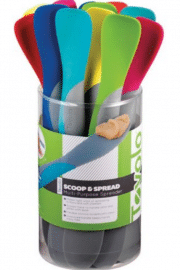 Use the tablespoon to measure the oreo mixture and form it into acorn shapes. I used a little bit more than 1 tbsp for each acorn. To make an acorn shape, form the mixture into an elongated ball, then pinch one end to make it slightly tapered. Place the acorns on a baking sheet lined with wax paper and place them in the freezer for 1 hour. After the acorns are hard, begin to melt the chocolate candiquik with the criso in a double broiler. 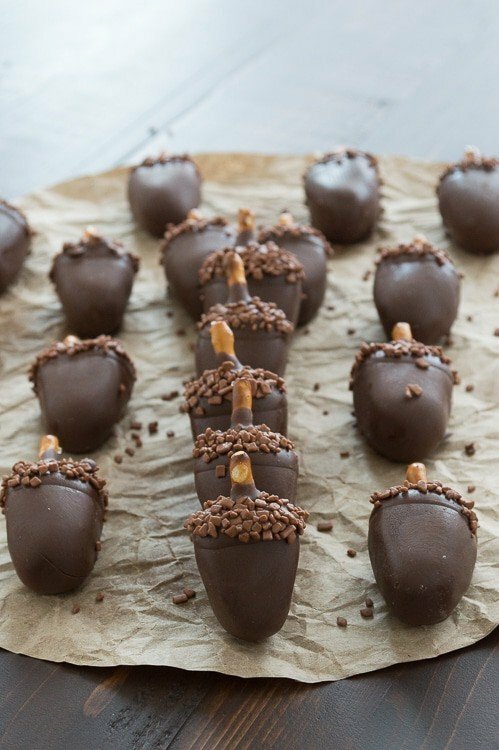 You will need a double broiler to keep the chocolate warm while dipping all of the acorns. I prefer to remove 3-5 acorns from the freezer at a time for dipping. To dip, place 1 acorn in the saucepan with melted chocolate. Use a spoon to spoon chocolate on top of the acorn, if needed. To remove the acorn use a fork to lift it out of the chocolate. To remove excess chocolate from the acorn on the fork, tap your wrist 2 times with your other hand. 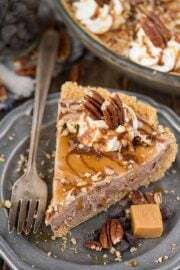 Scrape the bottom of the fork on the edge of the saucepan to remove more chocolate, then move the acorn to another baking sheet lined with wax paper using a toothpick to help get the acorn off the fork smoothly. Continue this process until all of the acorns are dipped. Allow them to harden at room temperature. 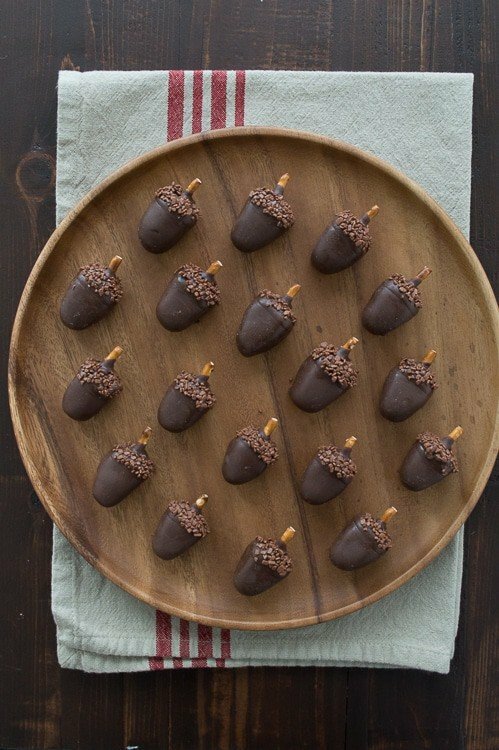 To add the chocolate sprinkles, dip the top portion of the acorn into the chocolate then dip that portion into a bowl with chocolate sprinkles. To add the pretzel, dip one end of the pretzel into the chocolate and press it into place. Return the acorns to the baking sheet to allow the pretzels to set. After they are set, serve and enjoy! Store leftovers in an container in the refrigerator. Brown jimmie sprinkles can be used as well! These are too cute! I’d love them at my Thanksgiving meal! Thanks Sheena! They would be perfect for a fall party too! These are so adorable!! I’m getting very lazy in my old age, so I’m not sure I’ll actually make them, but you never know :-). Your recipes are so much fun to check out, and I just love your enthusiasm! Keep up the fantastic work and keep smiling that gorgeous smile! You just make me smile Roberta! I appreciate your kind comments, they encourage me!! These are super cute, Beth! I’d eat the whole bowl, but the other party guests may think I’m “nuts!” HA! Kidding aside, these are great! I pinned them! These are the cutest acorns ever!! I love Oreo balls! I love oreo balls too, yummm!! These are just too much, Beth! Too cute and too delicious! A perfect holiday treat! AWW! These are TOO cute Beth!!! Okay I need a dozen of these! My kiddos would love them! They are so cute! Would they pretend to be squirrels while eating them? Haha! Love these, Beth! It is so hilarious to me that you have this squirrel/acorn love as a recurring theme on your blog and at your house. You guys are so cute!! Let’s just see how long it takes me to make squirrel cookies! Um sorta flipping out how cute these are! And peanut butter?! SWOON!! These are SOOOOO adorable!! Love your creativity and style. Pinning all over the place!! Awww, thank you Amanda! I really appreciate that!! This are just too cute. They look yummy. Well, anything with oreo cookies is yummy! I totally agree Melissa, oreos for the win! OH MY GOSH BETH, THESE ARE STINKING CUTE! SO CREATIVE AND FUN! I TOTALLY HAVE TO LOOK UP WALLY! Wally, he is the best!!! You are so creative, Beth! These are so fun! These are so stinking adorable. My kids would gobble them up. Oh who am I kidding. So would I!!! 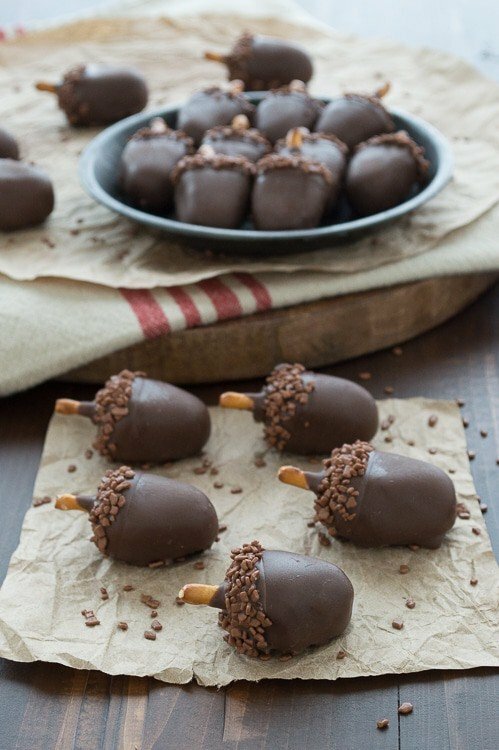 Normally, I am not a fan of craft food projects (kindergarten trauma) but these little acorns are freakin adorable and I wanna give them a try! Hahaa, kindergarten trauma?! Oh no! Aghhh these are SO ADORABLE. Beth!!! This are adorable! 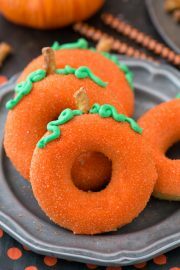 Totally can’t wait to make them and eat them with my little guy. Pinning! These look so cute and delicious! I was wondering if I could use butter instead of Crisco, or would it mess up the recipe? I have also used vegetable oil to melt candiquik, you could try that! I love the twist on the Oreo Truffles! These are so cute! 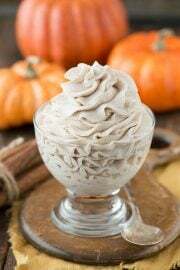 What a fun idea for a Fall party! Thank you for sharing! I’m so glad you like them Gwen! They are getting me exciting for fall again! How many does 1 batch make? ???? A lot, about 30-40 acorns! So cute. Do they have to be refrigerated due to the cream cheese? Hi Nancy! If you make them a few hours before serving, I would suggest refrigerating them until ready to serve! Also refrigerate the leftovers! Awesome! My neices will love these plz give us more fun recipes. My sister is famous for her Oreo balls at Christmas time, I am definitely going to make sure she sees this recipe!! I love baking and getting creative with my cooking & baking….however, I do have a lack of patience with anything that is really putsy, so I am wondering if you think using longer pretzels and pressing them into the Oreo mixture before freezing them would work with these?? I am thinking that if I did this, I could use the pretzel as a ‘handle’ for dipping and possibly eliminate a couple steps?? Hi Kristine! That would be a great idea if it works! Oreo balls are heavy and the worst thing would be if the pretzel broke while dipping! But if I make oreo balls again soon I’ll try this method and see how it goes! I missed what you’re supposed to do with the Crisco. Is it melted with the chocolate? Yes! Sorry about that! I went back in and clarified! I assume the dipped acorn is placed upside down to dry which also makes the top a little bit bigger to give it the look of a lid. Hi Carolyn! After I dipped the acorns I placed them on a silicone baking mat – laying on one of their sides. Mmmm that could be delicious!! Could these be frozen and used a week later? I believe you can freeze oreo balls before you dip them into the chocolate – freezing them after you dip them might cause the chocolate to crack. How did you make this shape ??? This shape looking like a strawberry shape ? Did you use some baking model ? Hi Julia! I just used my hands and eyeballed the shape as best as I could! I am also wondering if anyone used a longer pretzel stuck in the acorn for dipping. I think that would be so much easier, but am hesitant because the acorn would be heavy. THANKS! I want to make these but your comment “I highly suggest you watch the video first ” confuses me. There is no video attached to this??? Suggestions? They look sooo yummy! Why do you add crisco to the candiquik? Hi Marlene! I add crisco to the candiquik to help thin it out, so it isn’t so thick and so it melted evenly without burning. Oh my goodness. Confession: Both my husband and I loved squirrels separately before we got together… and we incorporated them into our wedding, with random little figurines. Not overboard or anything. ;-) My fall decor has squirrels. My son was a squirrel for his first halloween… and my daughter’s first birthday party is Saturday. It’s woodland fairy theme, so obviously… need to have some acorn cake balls. I’ve made oreo balls lots of times, so I am going to try this! I need to watch the video to see about putting the pretzel stick on. Does it harden enough to hold the acorn by the stick or is it just for looks? Thanks for this! I am excited to try it! Squirrel lovers unite! Hi Abby! The video will show you an example of how to dip oreo balls in chocolate, but it’s not specific to this recipe. Others asked if they could use the pretzel as a handle for dipping the oreo, and I’m not sure how that would work. These came out pretty good. Took me awhile to get the hang of shaping them right. No need for the Crisco in the chocolate. I used chopped peanuts for the acorn caps, rather than chocolate sprinkles. That sounds adorable with the chopped peanuts! Hi Beth. These look great. I am about to read link!!. As a Canadian our thanksgiving is gone.. however wouldn’t these work in a christmas theme?. You could totally make for whatever occasion you want! Hello, I was wondering if you left the acorns in the freezer overnight before dipping if it would be problematic??? I have learned that if I freeze oreo balls too long sometimes the chocolate coating sets too fast and it can produce cracks in the chocolate. I made these for my family at Thanksgiving and everyone went complete NUTS for them!! 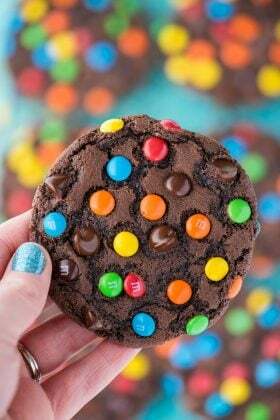 Will for sure be making these again!! How many grams in your package of Oreos? Hi Beth! Wondering about the soundtrack? Where can I find the music? Will be attempting the acorns this year. Thanks for the post! Hello.. 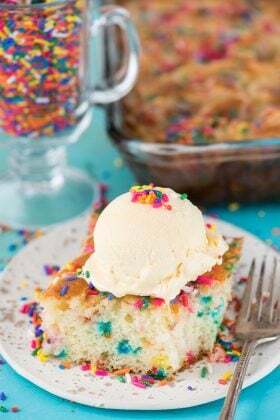 I am planning to make these the day before a party. Do you think that will be ok? Any tips or suggestions? Thank you! I made these for a party and there are zero left! They for sure didn’t look as good as yours but they tasted great. I covered them with chopped pecans instead of sprinkles. Covering anything in chocolate is such a mess for so many reasons, but I appreciated the tip about using the toothpick to get the acorn off of the fork! Oreo balls definitely take practice! 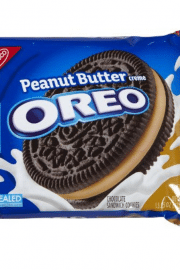 Quick question– will the cinnamon bun oreos (we don’t have the PB ones locally that i’ve seen) substitute well for these? Thanks! 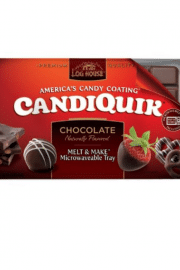 What is candiquik? Is it the same as candy melts? Yes! Just a different brand name! What is 1 package of oreos and 1 package of cream cheese? Package size in ounces would be helpful. Thank you! Very sorry Angie, added them in! 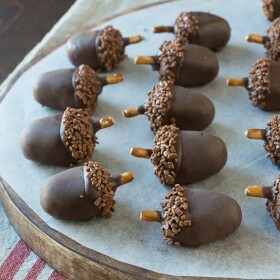 Thank you for the video on how to make the chocolate acorns, very helpful! Quick question do they freeze well, and how long can I keep them in the freezer? Hi Heather! I only freeze them until the oreo balls are firm – maybe 20 minutes? 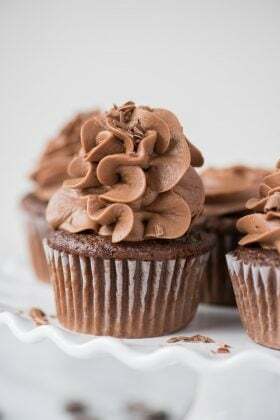 I would like to make these for a party…Could I leave them in the freezer for a few days before I dip them (instead of just one hour) so I can reduce my “party-day” work load? Yes! Just be sure to remove them from the freezer and place in the fridge about 3 hours before dipping. If you leave them in the freezer right up until dipping for so long, the chocolate can crack once you dip it because the oreo balls are so cold.